A shard of the Great Will. Carloso, the creator of all universes, sealed himself to confine his divided wills in various places. With losing him, the world met the era of raging chaos and scorching evils. And there was Nemyr the enlightened, who pitied all tears being shed from pain and agony. "You are my reflections, and you shall follow my will. You are the one thus the whole. Share the wisdoms that I spread. Now go, unite all powers for one. Find the Great Lord. Let the world shine once again." Those who were named "Knight" in the shape of light, scattered to many ends of the universe. Some reached the sacred land filled full of light. Some reached the battleground filled with hatred and malice. Their forms were diverse, but had a common origin. It led them to the way of finding Carloso. If there is any tiny sign, the Knights will jump into the mission right away without any hesitation. 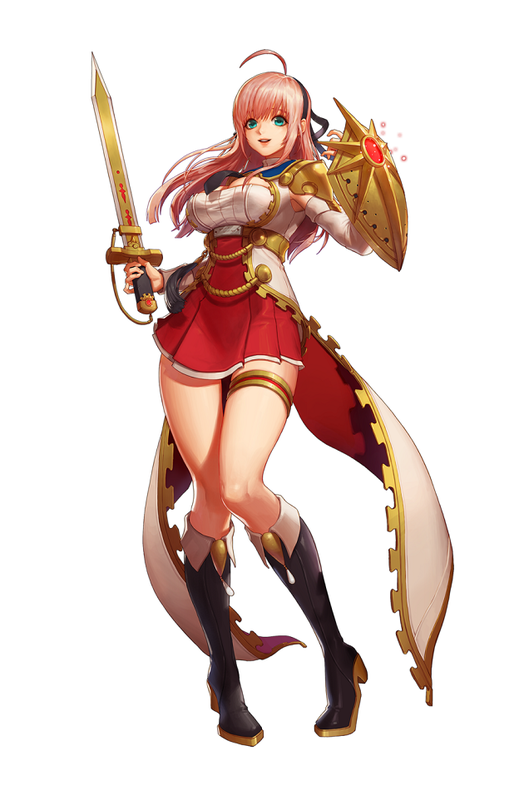 A class with somewhat more of an emphasis on defense, although her shield has many offensive uses. Chaos and Elven Knights can use various shields with different effects. Can guard while moving, Lightbringers and Elven Knights can also become immune to many status effects while guarding. A hardy warrior of nature who can chain her moves together with Chain Rush allowing for high damage potential if skills are timed well. Her skill set also contains some supportive and defensive skills. A demonic summoner who can call upon minions for support while also leading into the charge herself. Many of her skills have her minions following up on her attacks. A defensive fighter who can protect her allies and taunt enemies by creating large shockwaves. She can charge a resource called "Seraphic Feathers" by blocking attacks or using Sweeping Wave, which she can then expend to buff herself or heal her allies. A combatant who fights alongside her dragon, Astra. The effects of many of her skills change when used in the air and she can send Astra out on her own or have her perform skills alongside her. Whereas other classes simply devote themselves to one field when choosing a subclass, the Knight actually synchronizes with alternate versions of herself to obtain their powers.